1.To make the stuffing, in a small bowl, mix 2 tbsp soy sauce, chili paste, soy meat, and water. Let stand for at least 30 minutes. In a heated pan, add 1 tbsp oil and the stuffing. Sauté the stuffing for a few minutes then add chopped Thai basil leaves and cook for another 2 minutes. 2.Cut the cubed tofu in the center so that it opens in the middle (you need a hole in the center). 3.Stuff each hole with the stuffing. 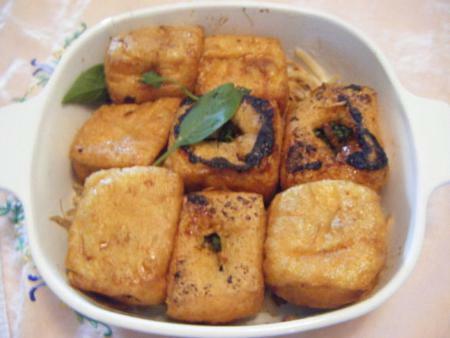 4.In a heated pan, add 2 tbsp oil, pan fry the stuffed tofu for 3 minutes. Flip over, and pan fry the stuffed tofu for another 3 minutes on the other side. Before it is done, sprinkle some sesame oil and soy sauce. Meanwhile, in another pan, add oil and sauté bean sprouts for 2 minutes. 5.In a serving bowl/tray, spread cooked bean sprouts first and top with cooked stuffed tofu on top. Garnish with Thai basil leaves or some cilantro leaves.